It may have happened anyway! He is the son of two very famous celebrities – an athlete and a singer – which automatically makes him a very desirable bachelor. She is a singer who has dated over a dozen male celebrities, mostly musicians. They were spotted together multiple times. The most recent time was at a private event. They were giggling over beers in a quiet corner, looking very happy and very romantic. There are a couple of possible issues here, though. First, our golden girl singer seems to be available. But our young male celebrity usually has a girlfriend. Second, his famous Mom absolutely HATES the singer! The singer is a lot older than our young scion and Mom does not like her predatory ways. See if you can guess our couple… without using any nasty nicknames! 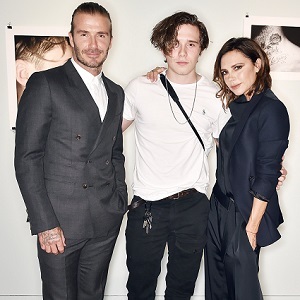 Brooklyn Beckham, 19, is the son of soccer star David Beckham and Spice Girls singer Victoria Beckham. We discovered that when Brooklyn turned 18, he went out on a few dates with singer Rita Ora. Victoria Beckham was NOT happy about this! And now the whole story is emerging. And in 2013, Rita dated Becks’ best pal Dave Gardner – another reason David is understood to have been angry. The couple eventually stopped dating. So, game over? Not quite. Here’s why Victoria Beckham is still mad about this. It’s not because Rita Ora is so much older than her son and because she has a reputation as a maneater who has dated everyone from Travis Barker to Calvin Harris to Bruno Mars to Rob Kardashian to Lewis Hamilton to Justin Bieber to ASAP Rocky to Drake. That was – quite literally – an interesting move on Rita Ora’s part. Now Posh has to keep her eye and both her son… and her husband! Yes, you know why. Congratulations to Reeceecup527 for being first with the correct answer! but if 7 years now qualifies as “a lot older” among consenting adults, there are thousands of men in trouble in the world, including my own husband. Nobody would blink if this were a 26-year-old man with a 19-year-old woman. Plus he’s not exactly a blushing virgin; he’s been around plenty, just not as well documented as Rita’s so-called conquests. Not to mention the “coaching” he’s no doubt had from his scumbag of a father. Gimme a break already. And there will be a baby in Ritas oven?…. Pretty girl but she always takes her clothes off. Can’t be taken seriously as an actress or singer if you tell on your body! You guys are so good! Hahaha! I didnt even know they are a “thing”. Brooklyn Beckham & Rita Ora? This has to be Brooklyn Beckham and Cheryl Cole…damn, she *really* wants those cele-babies!! Taylor Swift & one of the Beckham sons? Laughable but… Cheryl [Insert Surname] and Brooklyn Beckham? i’m guessing brooklyn beckham as the guy, but i have no idea who Singer is – considered Taylor Swift, but she’s in a relationship with someone else currently, so. But aren’t Brooklyn Beckham and Madison Beer the same age? Hmm this is difficult. The male sounds like Brooklyn Beckham but he recently confirmed a relationship with some model. As for the female, Taylor Swift fits the bill. Currently unavailable (dating Joe Alwyn), dates over a dozen men and a lot older than Brooklyn (if he’s the guy – 29 vs 19). Ariana Grande would also fit the bill I guess. Brooklyn Beckham and Taylor Swift! Brooklyn Beckham and Cheryl Cole would be very interesting! She just wants another child, be very careful around her. This can only be Taylor Swift and Brooklyn Beckham. Not a good couple but who cares? At least he got to pick one himself this time! And Posh can’t talk because he’s now a grown man and she’s got issues of her own. Hardly fit to give romance advice. Rita Ora and Brooklyn Beckham. Ora = Gold. Nasty = Janet Jackson + unknown. Rita Ora and Brooklyn Beckham. Victoria probably hates her because she can actually sing. Brooklyn Beckham and Rita Ora. Terrible couple, his dads probably already had her. Brooklyn Beckham and Rita Ora??? Brooklyn Beckham and… Rita Ora? Optional: Absolutely not. It’s way too big of an age difference and I find it kind of disturbing. No way..she’d eat him alive!